A rich British institution since 1839, The Grand National has been ground zero for a number of memorable moments in horse racing through the years. The 4 and a half mile steeplechase is also the largest jump race purse in Europe with an annual £1 million prize fund. From the odds-defying winners to celebrity owners to the equine neophytes who come for the party, all eyes focus on Aintree for three action packed April days. In honour of the Grand National time of year rolling around once again, we present a look at what makes this event so special: a tradition of brilliant triumphs and abysmal failures, and the opportunity to watch that tradition continue however it may. No tale of Grand National lore is complete without mentioning Red Rum, the most famous hero in the race’s 179 year history. Born with a flat racing pedigree suited for shorter races, Red Rum suffered an early career bone injury, and at one point was labelled “unraceable”. Nevertheless, famed trainer Ginger McCain worked the beauty horse from County Kilkenny, Ireland into a champion. Red Rum would capture the Grand National title a record three times in 1973, 1974, and 1977 while finishing second in 1975 and 1976. The most heart-warming story to come out of the Grand National is perhaps Aldaniti, the victor of the 1981 race. Aldaniti was an unlikely candidate to even appear due to a previously sustained leg injury that could’ve easily ended his career. At the same time Aldaniti was recovery from injury, his jockey, Bob Champion, was diagnosed with cancer and given just months to live. The pair dramatically overcame together, miraculously winning the race. The inspiring tale of Aldaniti and Champion was captured in the the 1983 film Champions starring John Hurt. With Aldaniti by his side, Champion raised millions for cancer research before the horse passed away in 1997. Beltrán Alfonso Osorio, also known as the “Iron” Duke of Alburquerque is perhaps the worst jockey in the history of the Grand National. As a child, he dreamed of winning the legendary race. On most of his seven races, he nearly died trying. He often started each race atop the horse with others galloping and then woke up in the hospital shortly after. During his first race in 1952, the Iron Duke fell from his horse and woke up in the hospital with a cracked vertebrae. In 1963, he fell from his horse again at the fourth jump. However, through perseverance, he returned in 1965. Once again, he toppled off and broke his leg as the horse crashed down on top of him. Bookies began to offer separate odds on the Iron Duke as to whether or not he would complete the race while still on his horse. He finally finished a race in 1974, but not before suffering a broken collar bone in training, forcing him to compete in a plaster cast on race day. He came in last place. The Iron Duke sought to compete again in the Grand National in 1976, even after suffering life-threatening injuries and a coma when trampled by several horses during another race. But it was not to be. His license was unanimously revoked “for his own safety”. In 1928 Tipperary Tim won the race because Easter Hero fell, causing 35 of the starting horses to also fall and pile up on top of each other. During another fence jump, four more horses fell, leaving only three in contention. Another jockey’s saddle slipped, which left only one horse ahead of Tipperary Tim. That horse slipped and fell coming around the final bend, leaving Tipperary Tim as the last horse in the race and, by default, a first place finisher overcoming staggering 100/1 odds. 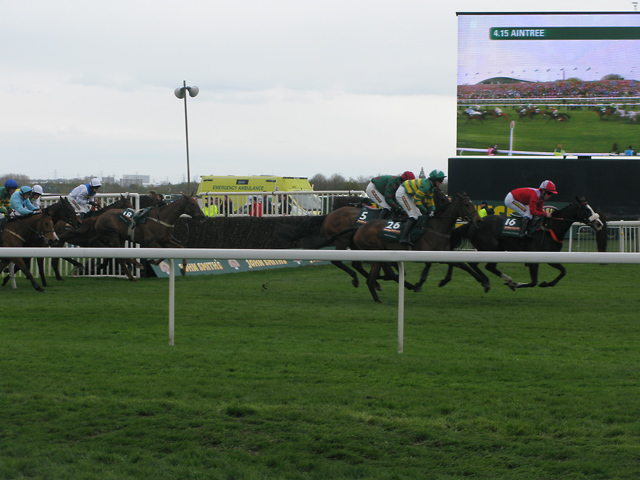 Four other outsiders at 100/1 odds have prevailed as Grand National champions, with Mon Mome achieving the feat most recently in 2009. The wonderful uncertainty of what may happen each year at Aintree brings out punters of all stripes. Each year, the race takes in north of £100 million in wagers. A glimpse through a Grand National guide is fantastic way to learn about the horses in the race and get a handle on odds; however this race especially has taught us to expect the unexpected.